Does your skin feel parched and dry after a bath? The soap and hot water tend to strip off the natural oils in the skin and make it dry and scaly. If you suffer from naturally dry skin, then you end up with white patches and peeling off skin. Exposure to wind and sunlight also dries the skin further. If you want skin that is soft and supple through the day, then the one thing you should not forget is to slather on a body lotion onto your skin, once after your bath and once before going to bed. Body lotions make up for the lost moisture in the skin. Using one soon after your bath helps seal in the moisture into the skin. Apply some generously in the night to repair your skin and replenish the moisture during your sleep. Take a look at our top 7 picks of the best body lotions for dry skin and pick one to get hydrated and smooth skin. 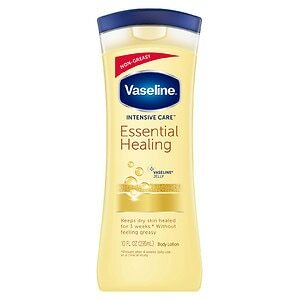 One of the most popular body moisturizers in India, the Vaseline total moisture is affordable and effective. It comes with Soy protein and vitamin E extracts. Daily use helps in replenishing the lost moisture in the skin. It is manufactured with a revolutionary Stratys multi layer moisture technology which penetrates deep into the skin and gives intensive moisture, lasting upto 24 hours. It comes in a 300 ml bottle, priced at Rs. 165. The Himalaya Intensive Moisturizing Body lotion comes with cocoa butter, olive oil, grapeseed oil, wheatgerm oil and vitamin E extracts. The lotion with a creamy texture helps you get rid of all of your dry skin problems and the organic ingredients nourish your skin throughout the day. Wheatgerm oil boosts the skins elasticity and the high antioxidant properties of the lotion help in keeping the skin firmer and toned. It is priced at Rs. 250 for 400 ml. The Jergens Aloe Soothing Refreshing Moisturizer comes with a fresh fragrance due to the aloe vera, cucumber, glycerin and eucalyptus extracts in it. The ultra light and hydrating formula works on extra dry skin too to leave it soft and smelling great. It gets absorbed instantly into the skin and leaves it rejuvenated and bright. Regular use gives you soft and well moisturized skin, that is free from any dryness. It is priced at Rs. 419 for 621 ml. 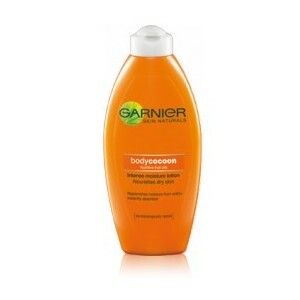 The Garnier Body Cocoon Moisturizer is an intensive formulation made from oils of avocado, black currants, olives and apricots. When you apply it soon after your bath, it shrouds the skin with pure and natural moisture which keeps it soft and hydrated. It has a quick absorbing formula that ensures that your skin never goes dry and doesn’t become oily too. It is priced at Rs. 170 for 250 ml. The Dove Indulgent Nourishment Body Lotion comes with a deep care complex which penetrates within the epidermis of the skin to provide it the much needed moisture from within. The rich lotion that is composed of shea butter does not weight down on the skin and gets absorbed soon as you apply it. It stimulates blood circulation giving you really fresh looking healthy skin. It is priced at Rs. 225 for 250 ml. The Nivea Nourishing Body Milk is made especially for women with very dry skin. The lotion easily spreads all over the skin due to its light formulation and it helps in replenishing the lost moisture from the skin. It is composed of avocado, almond oil and hydra IQ formula which moisturize and hydrate your skin. It is priced at Rs. 269 for 400 ml. 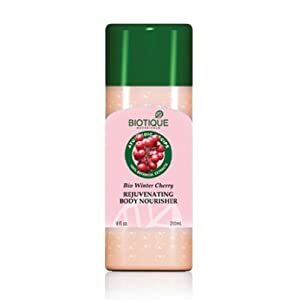 The Biotique Bio Cherry rejuvenating oil comes enriched with sunflower oil, mustard oil, almond oil and ashwagandha. The cherry extracts in the lotion give it the fresh fragrance. The sunflower and almond oil penetrate into the skin and make it really supple and guard it against aging. It is priced at Rs. 180 for 210 ml.